A hummingbird nectar recipe can turn your home and yard into a place where hummingbirds want to visit. These birds are very unusual, and so is the diet that they enjoy. Instead of providing seeds, nuts, and other solids, hummingbird feeders hold nectar, which these birds will usually get from flowers. When you look out and see these birds hovering around the feeder the sight is amazing. You can purchase a dry nectar mix, which is combined with water, but a better option is to use a hummingbird nectar recipe and make this food fresh. You will notice a difference in the number of birds that you attract. 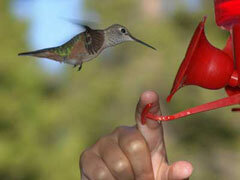 Attracting hummingbirds is not difficult when you offer fresh nectar that is clean and sweet. It is very easy to make, and does not take mush time or many ingredients. Simply add one part of sugar to a pan that contains four parts water. You can follow this hummingbird nectar recipe by using one half cup sugar to two cups of water. Next heat the mixture to boiling while you stir frequently. Once the mixture has boiled remove from the heat and cool the liquid. Some bird feeding tips suggest adding dye or food coloring, but most vets advise against this. Now you just pour the cooled nectar into the feeder. Every homemade hummingbird nectar recipe will follow these same steps. Boiling the mixture has two purposes, all of the sugar is dissolved and any mold, yeast, or bacteria is killed off. These organisms thrive on a sugar medium, which is what nectar is, and if not destroyed they can cause the birds to become ill or even die. When you provide plenty of homemade nectar you may even notice hummingbird nests being constructed, because the food supply in your yard is plentiful. Hummingbirds are fantastic to watch, and this recipe will help you attract more of them.